Dividends are a part of profit that a company shares with the shareholders. Dividends area great source of passive income especially if you are retired and living on the income generated from your investments. When I talk about investing for dividend income, people look at me as if I am talking nonsense. Not many investors know, but dividends are far more reliable source of consistent income compared to capital appreciation. Dividends are great source of passive income. Good companies pay regular dividends to their shareholders. Once you invest in a high dividend paying stocks, you get paid just for holding it in your portfolio. This makes dividend investing more reliable source of passive income. When the markets are going through bear phase, it’s a matter of worry for most investors investing for capital appreciation as they have to wait for a long time before they can book profit and make money. For dividend investors, a bear market is a great opportunity to accumulate high dividend yielding stocks at a lower price, which results in lowering their cost of acquisition, providing higher dividend yield. For example, if a stock is trading at Rs. 100 per share providing dividend per share of Rs. 10 per share, ?its dividend yield is 10% (10/100)*100%=10%. During market correction, if the price of the stock comes down from Rs.100 per share to Rs. 70, the total dividend yield will go up to 14% (10/70)*100%=14%. Buying a high dividend yielding stock during a bear market is a great way to boost your dividend yield, and provides freedom from tracking the price of the stock on a daily basis. The third advantage of investing in dividend stocks is that dividends received by the investors are exempted from tax. However, the company that decides to pay dividend has to pay 15% as Dividend Distribution Tax, because dividend are a part of companys profit which is paid out to the shareholders. Most of the investors invest in stocks for capital appreciation, what they usually overlook is the fact that dividends are far more reliable source of income compared to capital appreciation. Capital appreciation of a stock depends on the future performance of the business and is highly unpredictable especially in the short to medium term. Good companies pay regular dividends to their shareholders unless there is a huge loss to the company. Since such events are rare, dividend payouts by the companies seldom fluctuate and are more reliable and predictable than capital appreciation. Having said that, Dividend yield should not be looked as a sole parameter when investing for dividend income. A company with a poor fundamentals may not continue distributing dividends for a long time, that is why, an investor must make sure that the company with high dividend yield is backed by strong fundamentals and financial performance. 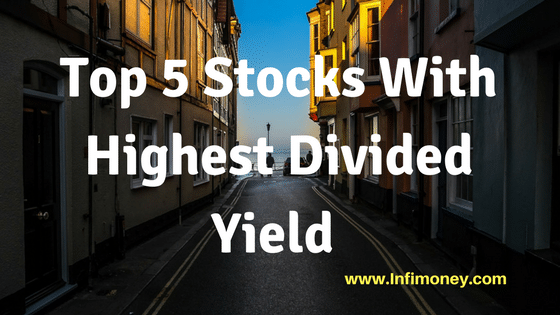 Based on these principles, we have listed highest dividend yielding stocks that have strong fundamentals. All these companies have posted good sales growth, have been growing their profitability, are almost debt free, and have been generous dividend payers for the past many years. Hindustan Zinc is engaged in the business of mining, smelting zinc, lead and silver metal.Company has five zinc lead mines and four zinc smelters. Company also has capacitive power plants and wind power plants in many states such as Rajasthan, Gujarat, Karnataka, Tamil Nadu and Maharashtra. Hindustan Zinc has metal production capacity of over one million tonnes per annum. Company has posted good financial performance in the past 5 years. Companys sales have increased from Rs. 12,699 crores in 2013 to Rs. 17,237 crores in 2017, a total growth of 36% in the last 5 years. The Net Profits of the company grew from Rs. 6,899 crores in 2013, to Rs. 8,316 crores in 2017, a total growth of 20.54% in the last 5 years. Company has strong net profit margins of 44%, and shows high Return On Capital Employed(ROCE) of 26%. Hindustan Zinc is almost a zero debt company, and has strong cash flow. Companys cash flow from operating activities grew at 58% in the past 5 years, from Rs. 4,785 crores in 2013, to Rs. 7,577 crores in 2017. Hindustan Zinc is one of the highest dividend paying companies with an average dividend yield of 10.89%. Himachal Pradesh, Uttarakhand, Bihar, Gujrat, Rajasthan, and also in neighbouring countries such as Nepal and Bhutan. Company also has many wind and solar power projects.The present installed capacity of SJVN is 1,969.85 MW (comprising of 1912 MW Hydro + 47.6 MW Wind Power + 5.25 MW Solar Power). SJVN has posted sales growth of 46% in the past 5 years from Rs. 1,682 crores in 2013 to Rs. 2,468 crores in 2017. Companys profit have seen a growth of 46.7% from Rs. 1,052 crores in 2013 to Rs. 1,957 crores in 2107. Company has low debt to equity ratio of 0.19. Companys operating cash flows have increased 41.89% from Rs. 1,616 crores in 2013 to 2,293 crores in 2017. SJVN is the second highest dividend yielding company that pays average dividend yield of 8.86%. NLC India or Neyveli lignite, is a Navratna, profit making Government Of India enterprise engaged in mining of lignite and generation of power through lignite based thermal power plants. Company has diversified from thermal power to solar and wind based power plants. The basic portfolio of the company is lignite mining, thermal power generation, solar power generation, wind power generation and coal mining. NLC India has shown a strong financial performance in the past 5 years. NLC Indias sales have doubled in the past 5 years from Rs. 5,590 crore in 2013 to Rs. 11,128 crores in 2017. Companys net profit have also seen a growth of 67% in the past 5 years from Rs. 1,457 crores in 2013, to Rs. 2,447 crores in 2017. Company has debt to equity ratio of 0.49, and has been rising since 2013, investors investing in this stock must watch the debt levels frequently. Coal India has posted good growth of 22% in sales from Rs. 68,302 in 2013 to Rs. 83,808 crores in 2017. Coal Indias net profits have fallen in the past 5 years from Rs. 13,576 crores in 2013 to Rs. 9,265 crores in 2017. Company enjoys healthy profit margin of 14% and ROCE of 80%. Coal India is a zero debt company. ? Coal India has posted strong growth in operating cash flows of 73%, from Rs. 9,109 crores in 2013 to Rs. 15,846 crores in 2017. HPCL ha seen a fall of 14% in its sales figures, from Rs, 2,06,722 crores in 2013, the sales have fallen to Rs. 1,77,700 crores in 2017. HPCLs profits have seen a good growth of 312% from Rs. 904 crores in 2013 to Rs. 3,726 crores in 2017. Company has low profit margins of 3%, however, the profit margins have seen a great improvement in the past 5 years. HPCL has decent ROCE of 7.9%. HPCL has debt to equity ratio of 0.8, which is on the higher side, however, it is the lowest in the past 5 years. In 2013, HPCL had a debt to equity ratio of 2.74, which was very high compared to current levels. HPCL has seen a huge growth in operating cash flows of in the past 5 years, from Rs. 895 crores in 2013 to Rs. 9,9,82 crores in 2017. HPCL is the fifth highest dividend paying company with an average dividend yield of 5.59%. The best thing about dividend investing is that you get paid just for holding a stock and you get paid not just for the entire lifetime, but for many generations to come. Many investors rely solely on dividend as a source of income. As said earlier, dividends are the best source of passive income, however, an investor must be careful while investing for dividend income. Before making an investment, an investor must look at the past financial performance of the company and its dividend history, Companies with strong past financial performance and long dividend history are better dividend candidates. If a company has either poor or inconsistent financial record and infrequent dividend history should be avoided. Decision to distribute dividends lies completely in the hands of the management, if they have enough cash and cannot find a good use of it in their business, it is distributed to the shareholder. Companies mentioned above are cash rich and and have a long history of strong free cash flows. There is a good probability that shareholders will keep receiving dividends every year. The dividend yield may vary, depending on the amount of disposable cash company has. If you are looking to invest in these companies from dividend income perspective, you can start buying them in small quantities regularly. Any price correction is an advantage for you as a dividend investor as dividend yield is inversely proportional to stock price. If the company keeps paying same dividend year after year, every correction will improve your dividend yield. Can we find anywhere list of companies issued dividend in 2017 ? If you find the history of dividend given by the company, there are two sources to find that data. Step 2: on the left side you will see a banner of options such as quote, chart, news, comment etc. Step 6: You will find a chart for the last 5 years comparing dividend paid compared to net profit of the company. One must keep in mind that dividend is payable on the face value of the stock and not the market traded price. For example, Hind Zinc is trading around Rs 300 but the face value is only Rs 2. So dividend % will be on the face value. This is important to keep in mind. If Hind Zinc is paying 10 % dividend and you own 1000 shares ( Costing Rs 300000 to buy ), your dividend at 10 % will be Rs 200=00. Hi Genesis, yes the dividend is payable on the face value of the stock. That is why I have used dividend yield for measuring the dividend paid by the company. Dividend Yield is calculated by dividing dividend per share by the market price of each share. In other words, dividend yield tells us how much return an investor is getting as dividend against each rupee paid for buying the share. Hindustan Zinc paid a dividend of Rs.29.4 on each share. The current market price of Hindustan Zinc is Rs.300. By dividing dividend per share with the market price we get a dividend yield of 9.8%, which means, if the company continues to pay same amount of dividend every year, you will get a return of 9.8% on your investment, which is much higher than any bank deposit.